Help! I have a knitting problem. I can't seem to knit with neutral colors. White, beige, khaki, ecru... it just won't do! Jewel tones are my thing, and it is not surprising that I took a floaty fairy-tale neutral top from the Spring/Summer Rowan Magazine 55 and made it into something you would find in a pirate's treasure chest. 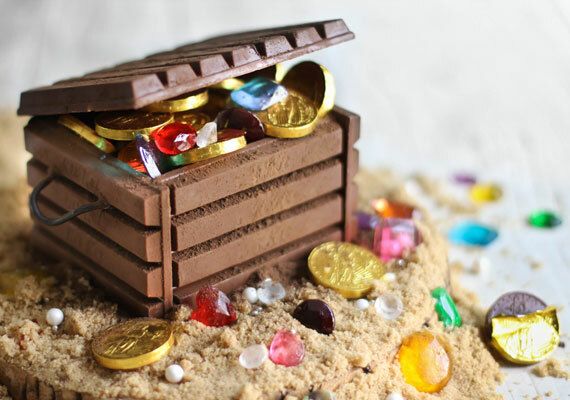 Mmm, yes, that's a Kit Kat treasure chest! Instructions here. This is the virginal Madonna by Marie Wallin, designed for Rowan Cotton Glacé, Fine Lace and Kidsilk Haze. 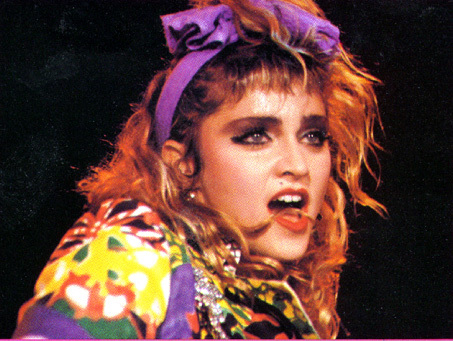 But I didn't want a virginal Madonna, I wanted a pop Madonna! The pattern is just an oversized rectangular body with skinny drop-sleeves -- something that is very fashionable right now. I've seen Rowan do a lot of boxy patterns lately which I haven't liked, and usually it's because the knit fabric is too thick to hang the way the fabrics used in current fashion do. But here was a pattern for laceweight yarn, filled with silk and drape, and finally ideal for boxy shapes. Even better: with all these stripes and colors, I could do a good dip into my stash! This was my first foray into my jewel tone idea. I had some of my old Kidsilk Haze-like stand-by (Artfibers Tsuki) that was leftover from 2 favorite projects. See my post on my Marshmallow, Embellished here. 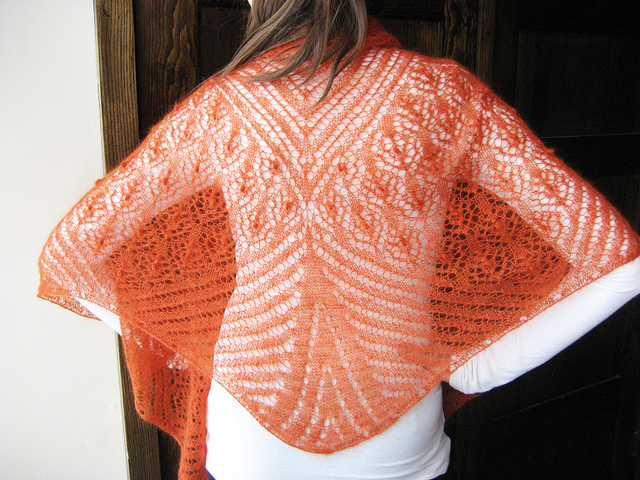 See my Valentina Wings on Ravlery, here. 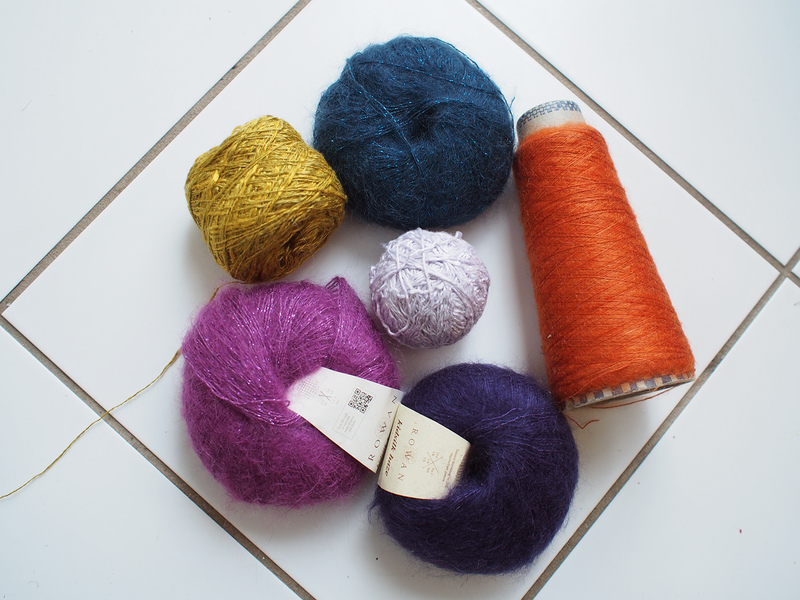 I also added 3 sample balls of recent new yarns from Rowan. It's always a challenge to use single balls of yarn, so I was delighted to see some color matching between two serious jewel-tone sparkly Kidsilk Eclipse shades and one ball of the totally luxurious 100% mulberry silk, Truesilk. 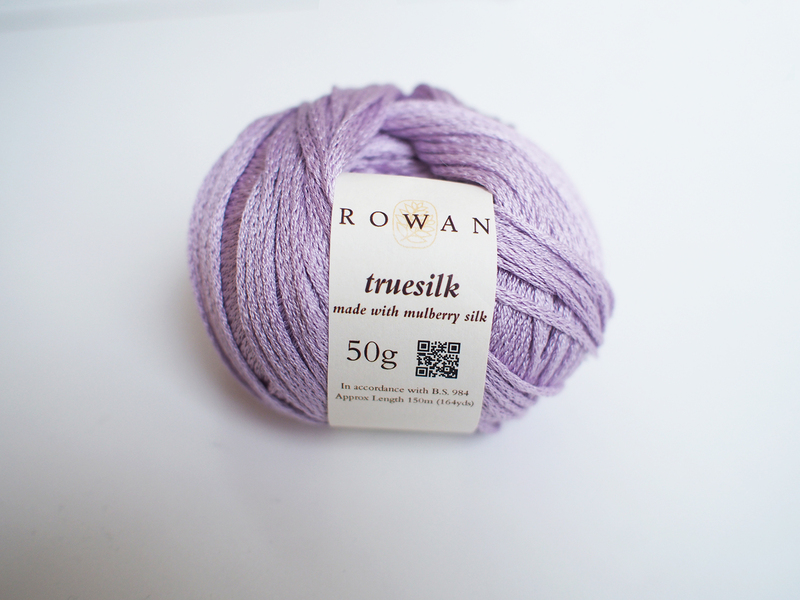 Make sure to tie a knot in each end while working with this gorgeous luxurious yarn! Finally, I rounded it out with a huge cone of random endless thick and thin yarn that I have about 5000 yards of, and some frogged Alchemy Bamboo that had been re-purposed to 3 failed projects and needed a new home. GO STASH! The pattern has you cut your yarn after every stripe. One of the reasons for this is that you don't always end up on the same side as where you started because of odd numbers of rows. At first I decided I would even up the numbers of rows so they ended up on the same side, and then carry the yarn up. I abandoned this after the first few stripes. First, it was good to have odd numbers of rows in some cases. For instance, this stitch pattern, which is made by looping the yarn over the needle 3 times while you knit, looked much better with 2 regular rows below than 3. Second, this is a very lacy pattern. 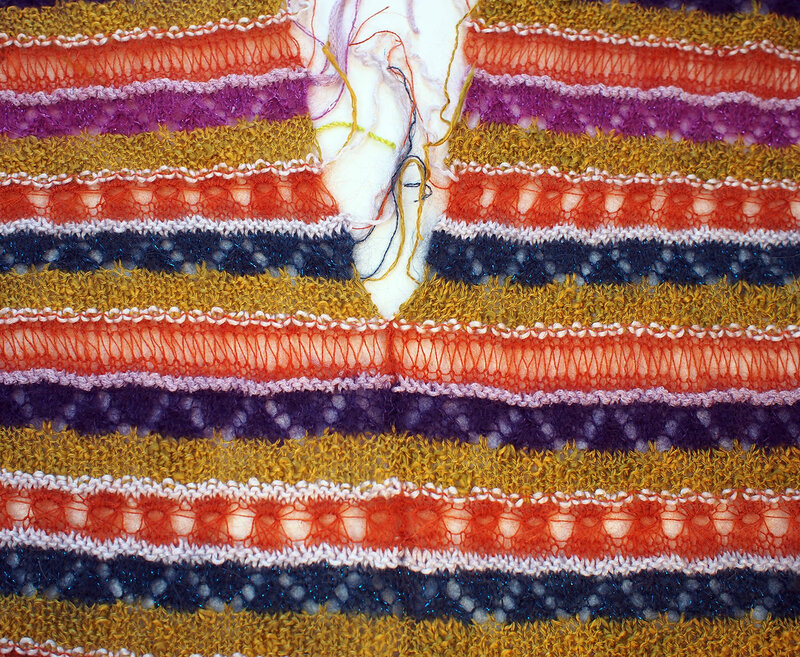 The last thing you want is to see the wrong color yarn showing through the side while being carried up! And here is where I want to give a little advice: make a stitch pattern YOUR OWN. Knit it up and see if you really actually like it! 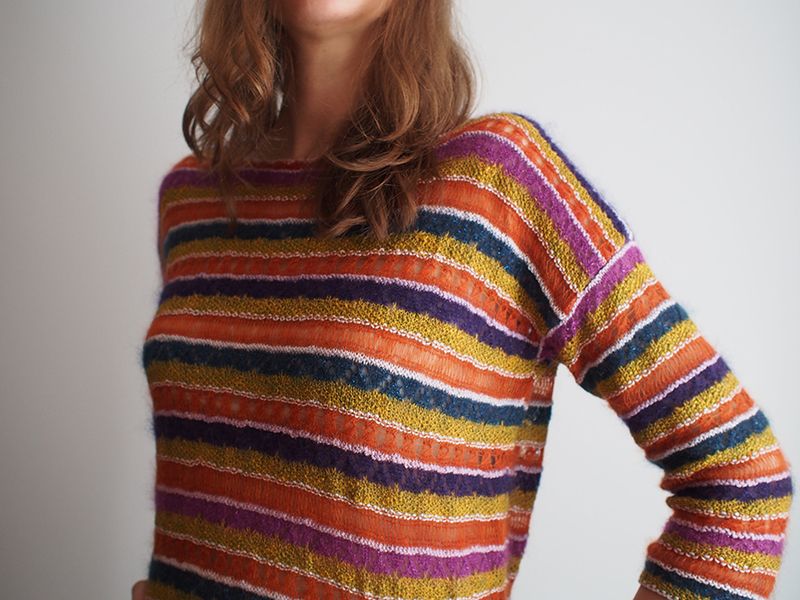 For stripes like this (which will take an excruciatingly long piece of your life to make), find the combo YOU prefer. I used the start of the back as my experimentation board and gigantic swatch. If you manage to look closely at it (and no one will), it doesn't match exactly with the front. Here are some of my suggestions to make the little stitch patterns better. 1. Try to avoid purling with a new color on the wrong side. 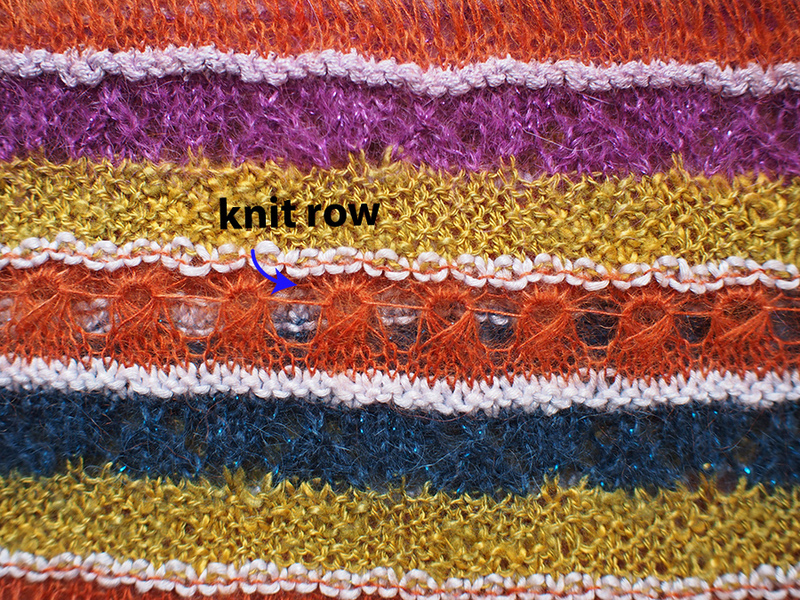 All of the Cotton Glacé rows are only 1 row, and that row shows up as a purl row on the right side. 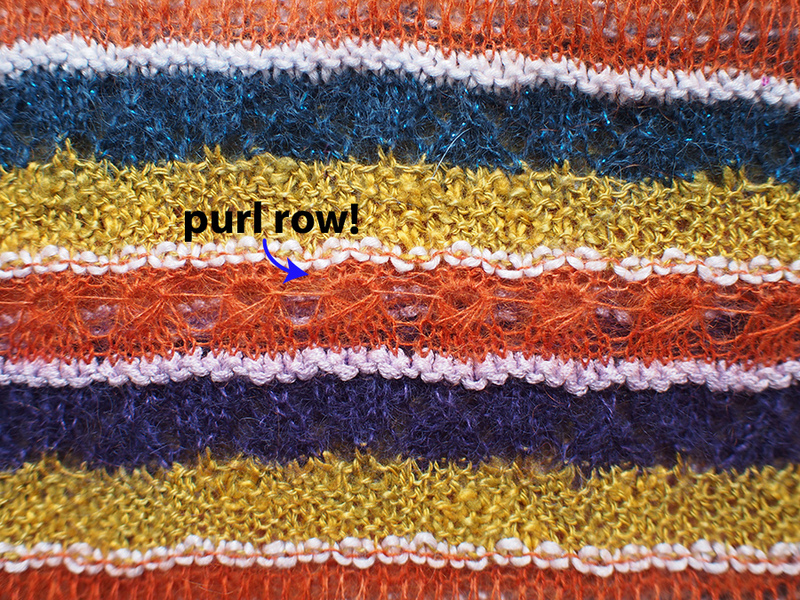 Purl rows are nice, but when a NEW color is added, they show a stripe of the old color mixed in with the new. This works fine with neutrals or similar colored yarn. But it worked terribly when I transitioned from light colored yarns to dark yarns. 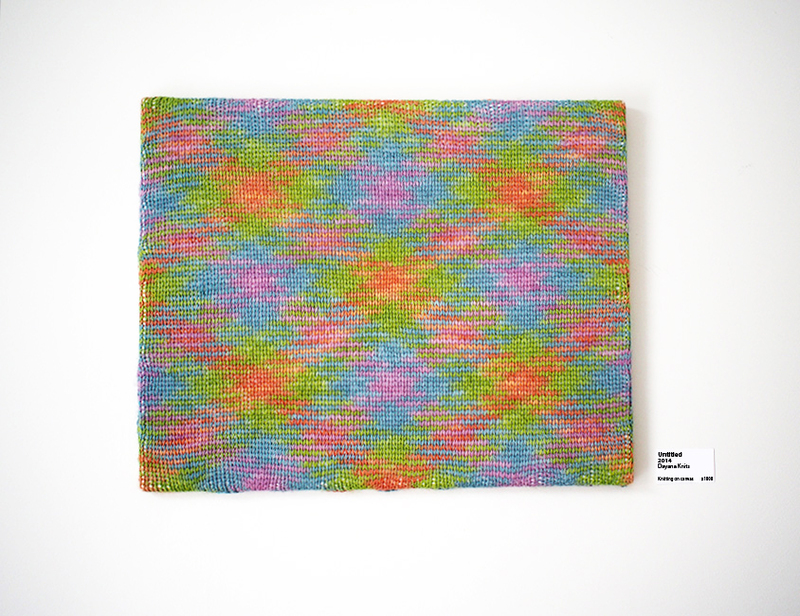 I decided to keep the purl look for only one of the color transitions. For the rest, I changed it from one to two rows, first knitting one row on the right side to avoid the color change showing, and then adding the purl bumps by knitting a second row on the wrong side. 2. The most awesome stitch is this circular stitch which is made by knitting into 5 long stitches you make in the row before. I made a mistake at some point where I had a purl row after the circle instead of knit. Wow, that looked so much better!! 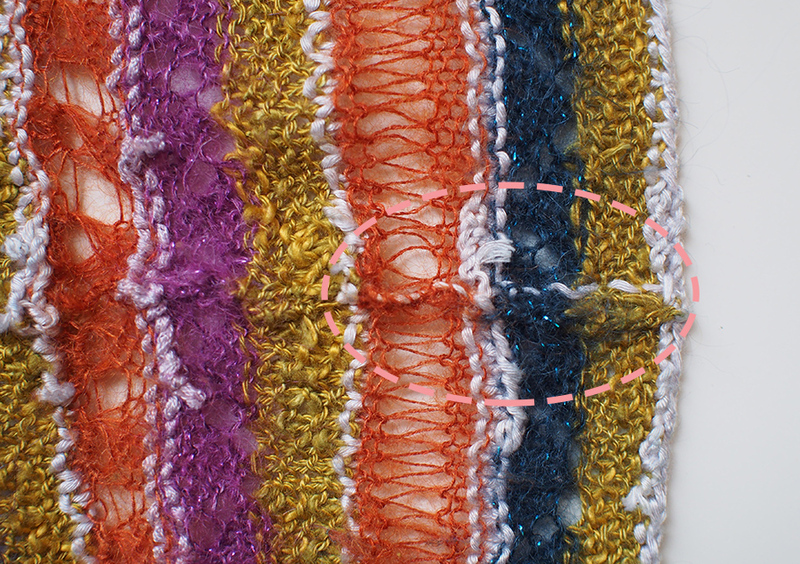 It gives the stitch a little more texture, almost like adding filligree points to a corona. 3. 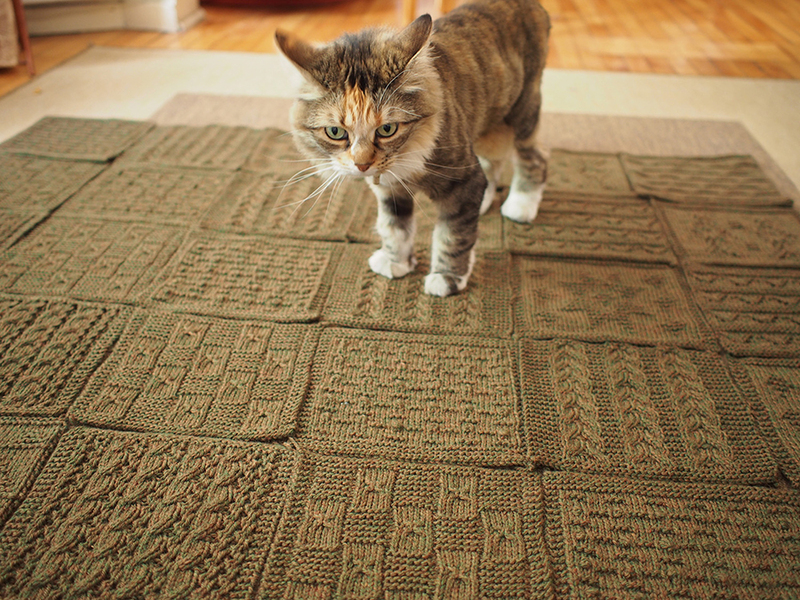 Don't feel trapped by the odd or even number of rows per stitch pattern -- because you know what? It actually doesn't matter! Because you are cutting your yarn after every stripe, there is nothing to stop you from starting from either side of your knitting. This is really revolutionary if you think about it. Specifically, what I mean is this. Say you just finished a right side row and you are going to cut your yarn on the left where you ended the row. 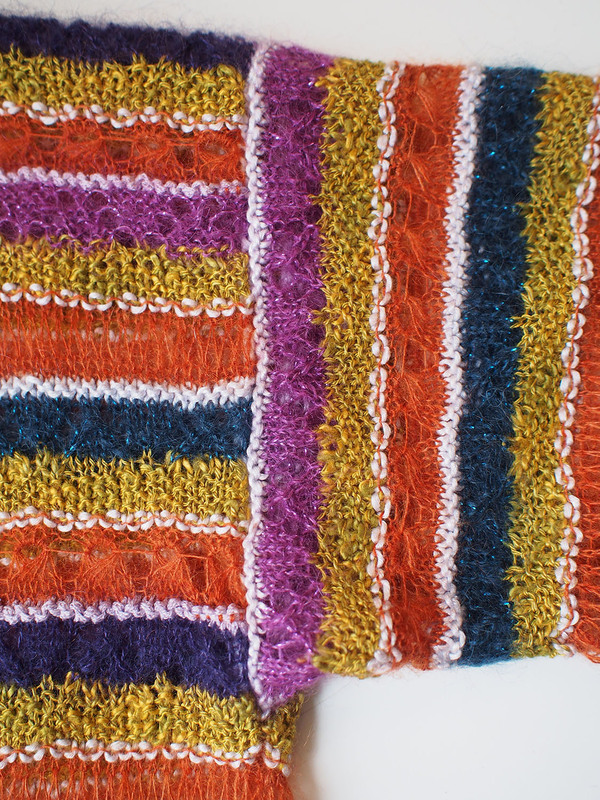 It is the exact same thing to either start on the purl side row where you left off OR to connect the yarn back where you started, and begin with a consecutive right-side row! 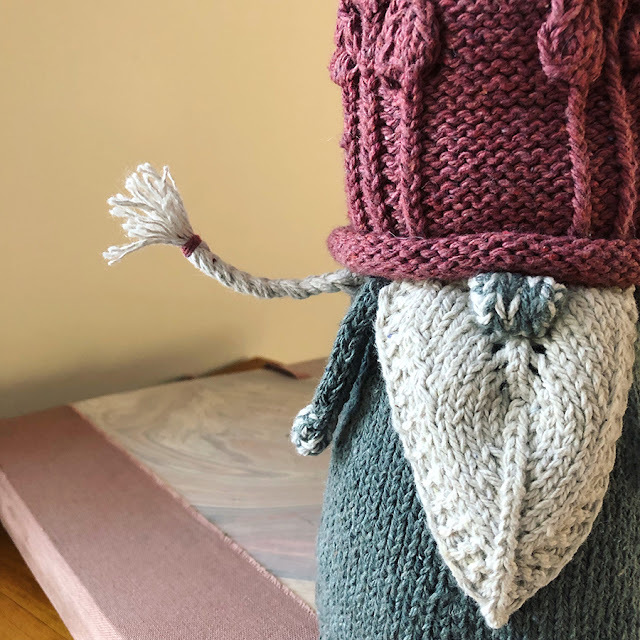 You're probably concerned about the amount of ends involved in knitting something like this. Oh yes, there are billions -- but I have something to make you feel better. 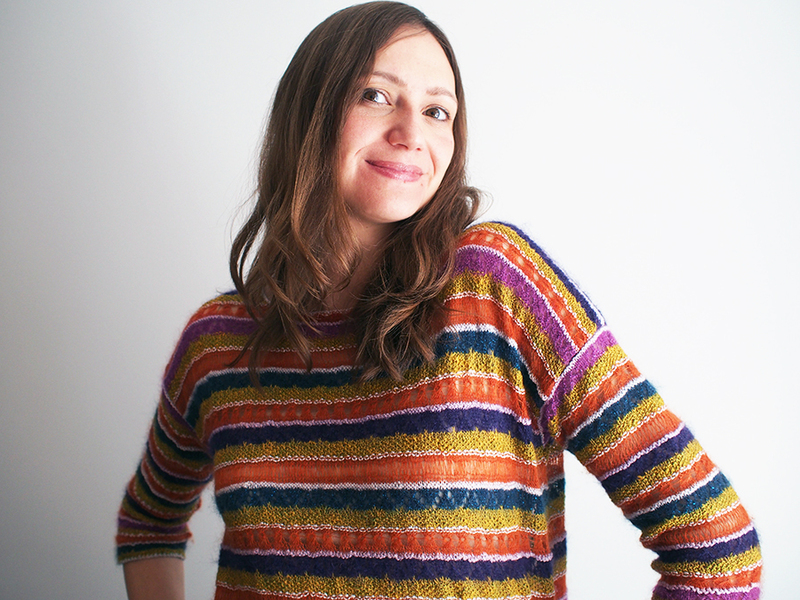 You can use one end of every stripe to knit the stripe together in the seam! Not only do you use up an end and sew your seam, but you never have another color showing in that stripe. 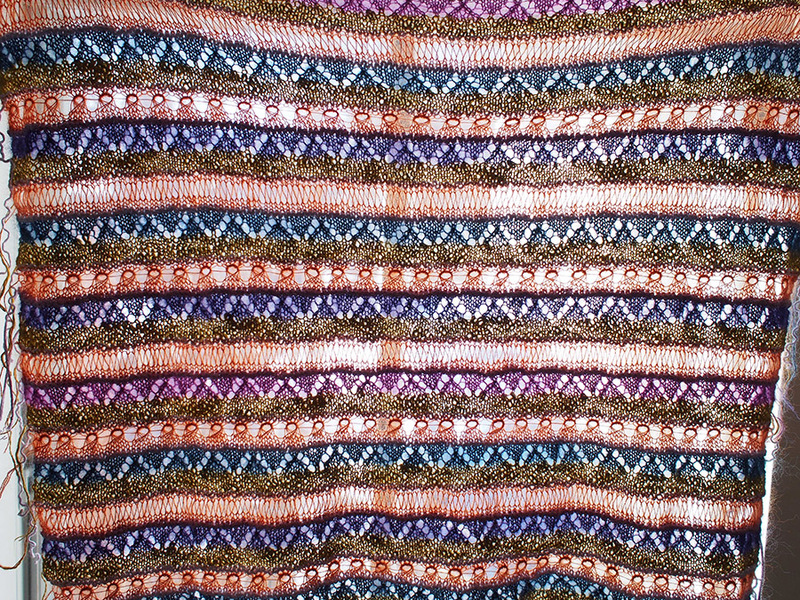 I used mattress stitch to sew up each stripe using an end. The results were more perfect than I imagined they would be. This was one of the most work-intensive projects I've done in awhile. It wasn't hard to do, but it took forever! I estimate that I put more than 150 hours of work into it. It used 2.75 (US 2) needles and was 41 inches wide! I found a way to shave off a few hours though. I noticed on Ravelry that the sleeves were coming out rather long and I wanted them to end right after my elbow. Also, I wanted them to be super-skinny. So I decreased the number of stitches cast-on and only increased until a width I needed. That's what's great about drop sleeves -- you just stitch them straight into the body, so you can infinitely change their width without having to do anything with the body shaping. You may have noticed that it is NOT spring in Montreal yet. I was looking around for some kind of bush, evergreen, anything that would suggest the turn of the season... and nothing! What to do? Pretend like you live in a post-apocalytic abandoned industrial zone that wouldn't have trees and flowers no matter whether it was in the height of summer. My flowers are painted words! OK OK, I found sooooome trees. Hey! How do you like them boots? AND NOW FOR THE RESULTS OF THE PLANNED POOLING GIVEAWAY! I was thrilled to receive 112 entries for my Fine Art Aran giveaway. The two Grand Prize winners will receive 2 skeins of colorway Bolero each, and the Second Prize winner will receive 1 skein. Congratulations!! You all gave me Ravelry names so I will see you there. 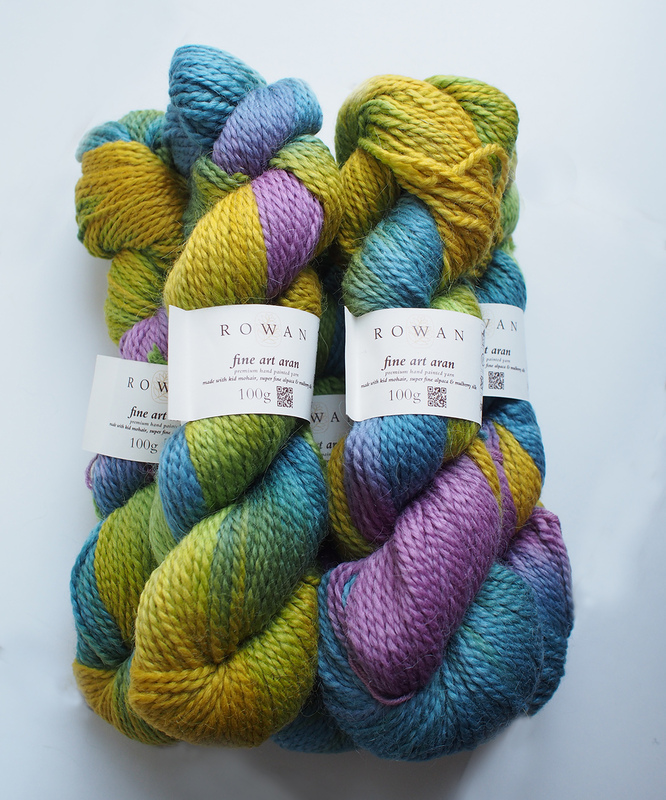 :) Thank you all for participating and KEEP FOLLOWING as there is sure to be another Rowan yarn giveaway in the near future. I was waiting to see how this one would turn out - I really like the slim sleeves. And the boots!! Yea, such a great piece! I so love the way you go through your thought process and share it with us. It really makes the project, yarn, pattern, technique come alive. 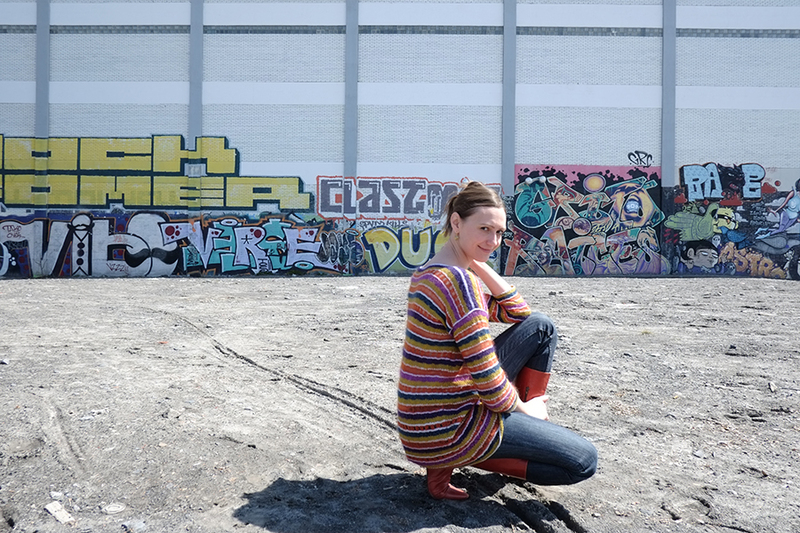 Had to note your silliness though, does look like an apocalyptic place but that is why you are there... You and your sweater are all the flowers, color, and love that is needed! 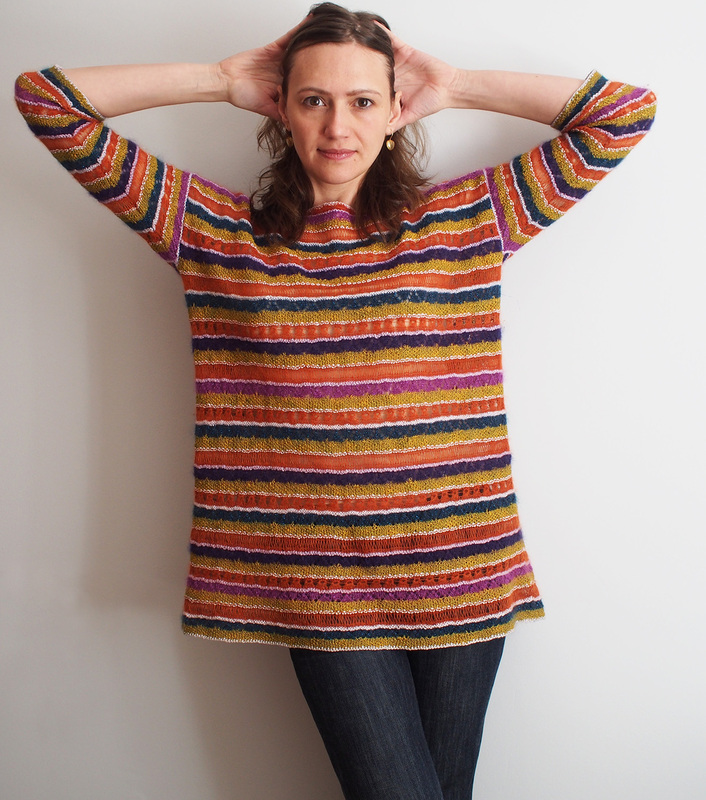 Question, in your opinion would this sweater knit up well in the round, i.e.. using circulars? Thanks again, love the blog. Hee hee, that would be so much fun! Bonus: it's easy-peasy to pack and weighs almost nothing. Alas, this "exchange" may have to happen in West Coast Cali, though. Isn't it so fashionable? It fits in perfect with all the hipster girls walking around me. Well, your version turned out more eye-catching than the virginal one. Very pretty.....which is actually a bit of an understatement. Thanks Una! It's truly a head-turner. Another amazing FO. Love all the stash colours and it goes perfect with your boots. And at least all the snow is gone in Montreal. My brother still had a foot of it last week in Sault Ste. Marie. The greenery will come. . . I will just wait to collect more left over fine yarn, and one day I'll do something like that too ��! Very pretty! I'm afraid that I wouldn't have enough of a color and would have to measure each stash item first. Some is super fine and will not work in my yardage machine :(. Ah, I understand. But to be honest, I have so much left of the single balls of Kidsilk Haze. If you go to my Ravelry page, some of the balls are labelled with exact amounts. Hope it might help! Great tips you shared and I am with you on your choice of going Jeweled tone ...I am jewel tone kinda girl too so I am with you on going "pop Madonna" here! The sweater is gorgeous and the boots are definitely made for walkin!!! Love them! Spring is coming very slow here on the east coast too ! Thank you, as long as it's dry, these boots ARE walkin'! Ugh. Dying for some warm weather... I had to pull on my coat a second after each photo! That's a fabulous sweater with some great color combos! I'm basically a solid-color person because I just don't have the patience to deal with all the different yarns and all those loose ends. Maybe someday I'll try a simple stripe. That's a good start! 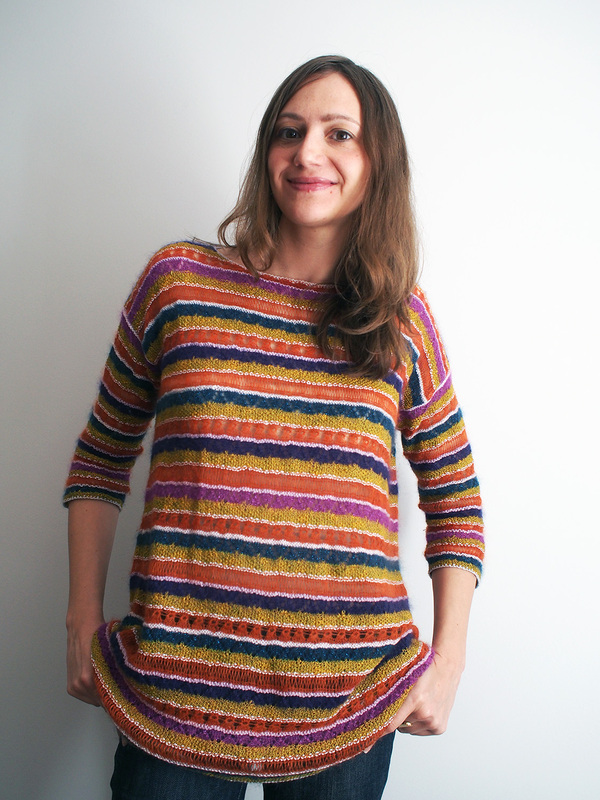 And with simple stripes you can carry the colors along the seams to reduce ends, no problem. 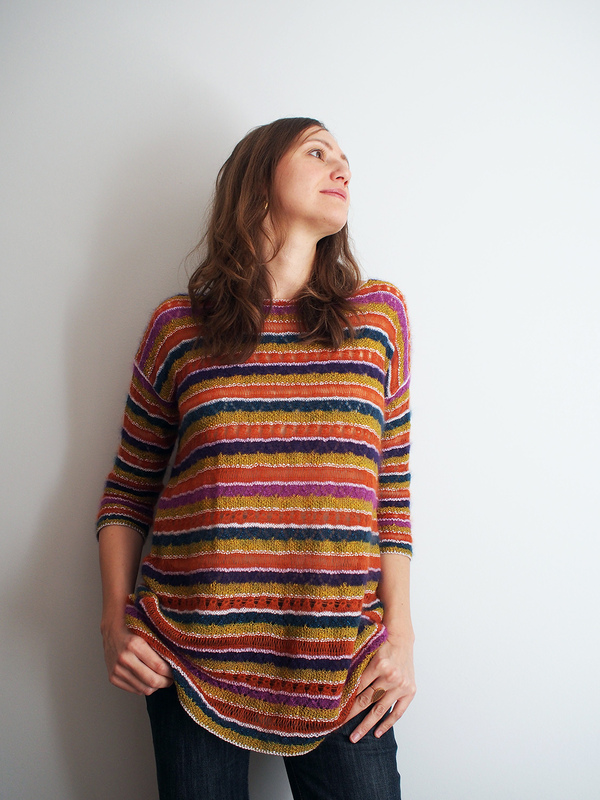 Tying loose ends in AS seaming, that is genius! Well done, it looks very pretty indeed. Thank you! I'm not sure I would use the ends all the time, but especially if the colors were really off or the stripe was see-through. That is fantastic. 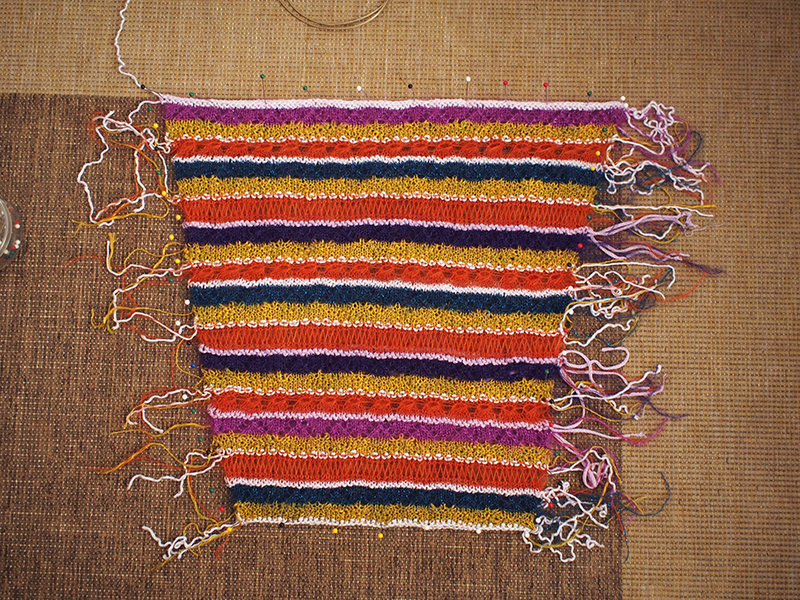 When I saw the "in progress" photos on ravelry I thought it looked awful. But now it's finished it's great. I wish I had an eye for colour - I'll be doing the virginal version, but that's adventurous for me because I usually wear black. I was a bit worried about the sizing, but you look the same size as me, and it's really flattering. If you wear black mostly, then virginal will almost be like me doing the clown version! :) If it helps, I have ~35in bust and not much waist, cant remember exactly, but I'm not very curvy. I lovw this sweater!! 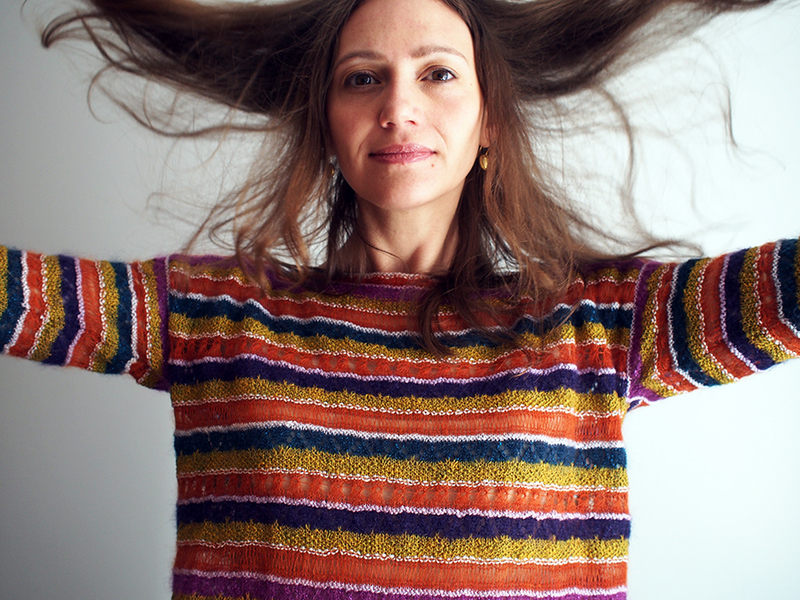 Your colours look amazing and its exactly what I would do, I hardly ever knit in neutral tones. 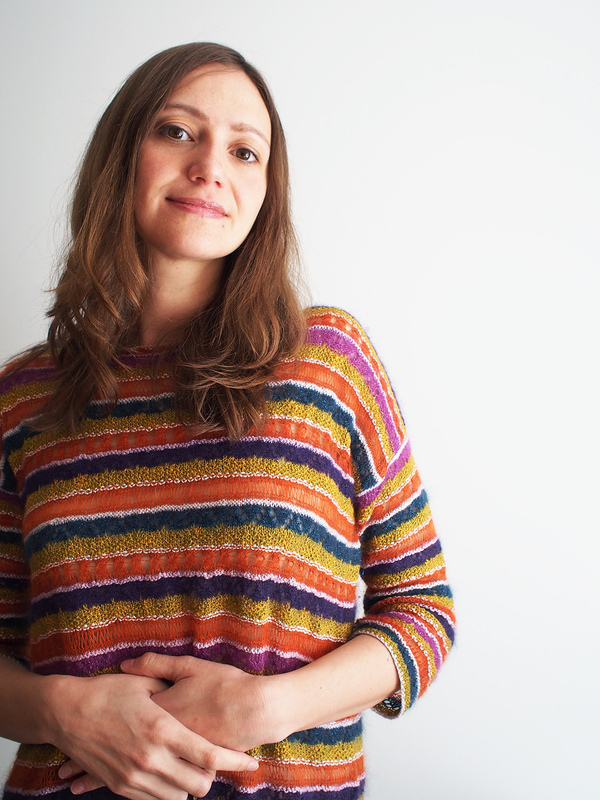 Wish I had considered seaming with the coloured ends on my stripy cardigan instead of weaving them in now, what a great idea! 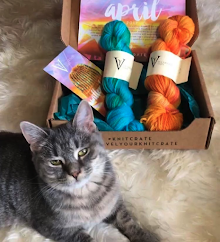 Thanks epicyarns! Jewel tones forevah! 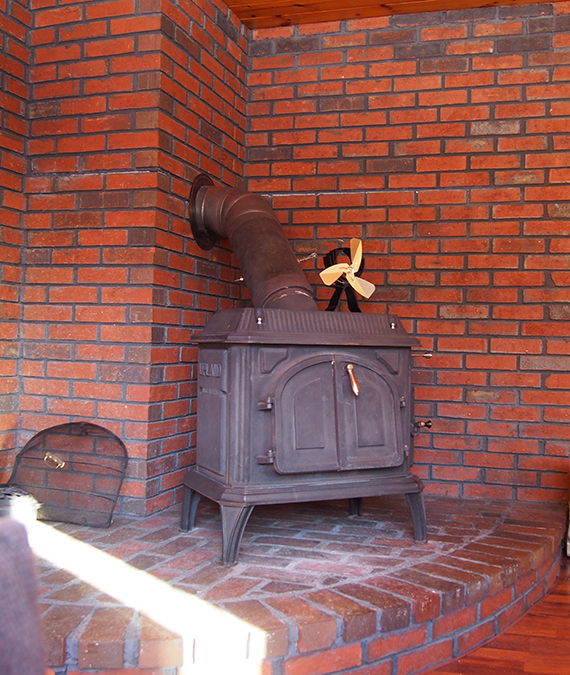 I am a hugh Rowan fan and I love the way you change some of the patterns. I find your posts sooo inspiring. Thank you so much. Ann I'm so glad you like Rowan as much as I do and thanks so much for following. The little tips are peeling on my boots, it's worth crying over! Aww, thanks Rose. Anything to help the masses! I am in awe of your time investment in this project! That is extremely impressive! Love this top with your boots, fabulous! I've got another pair of boots, they look like salty caramel (to bring to mind one of your recent posts, hee hee). Time to match my stash! 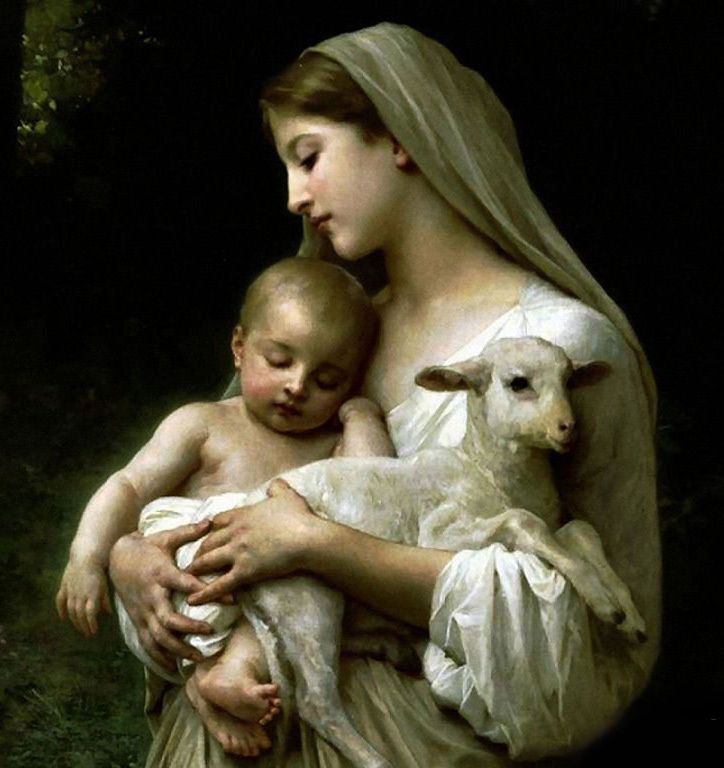 This really turned out great--so much more interesting than the original "virginal madonna." I really enjoy reading about how you make these projects your own, with intelligent modifications. And thanks so much for being generous in sharing your process and offering good advice. Thanks Noreen, you make me blush. It's my passion, making things work a little better, I'm glad you enjoy reading about my mods.